Rubashkin's butcher shop in Brooklyn was still well-stocked as of Tuesday, June 3, 2008, but elsewhere kosher meat was less plentiful. NEW YORK (JTA) -- Jacqueline Lankry doesn’t know how she’s going to fill her orders. The owner of a kosher catering firm in Fort Lauderdale, Fla., Lankry orders a box of meat and poultry every week from Agriprocessors, which runs the nation’s largest kosher slaughterhouse. But production there has slowed to a crawl since a federal immigration raid last month at its plant in Postville, Iowa. Lankry learned June 4 that this week’s box isn’t coming. "They told me they have no merchandise," she told JTA. "I'm closed for business today. I’m going from store to store looking for meat to fill my orders." Instead of buying wholesale chopped meat for $2.19 a pound, Lankry is dishing out $6.99 to buy it retail. That’s going to hurt her bottom line in a big way, she says, but she’s stuck. There are no other kosher meat suppliers in town -- everything comes from Agriprocessors, which she and other caterers refer to as "Rubashkin’s," after the family that owns it. Lankry doesn’t know about the raid, problems with the workers or PETA’s allegations of inhumane slaughter methods. She just knows that if Agriprocessors shuts down, she and many others will be out of business. "We don’t have a choice," she said. The 400 undocumented workers arrested in the May 12 raid and their families are living in limbo, out of work and facing deportation. But now the fallout is beginning to extend beyond those most directly impacted. The production slowdown at the Postville plant has finally hit the nation’s kosher markets and, by extension, kosher consumers. Retailers from coast to coast are reporting trouble having their orders filled. Many are hiking prices, although they are generally vague about whether the increases are coming from Agriprocessors or competing suppliers. Bottom line is, there is less kosher meat, and it’s costing more. Some retailers aren’t even bothering to order from Agriprocessors, which has scrambled in recent weeks to bolster its depleted work force. Klara Gottesman, manager of the meat department at Kosher Marketplace in Manhattan, stopped a week ago. "I know they don't have stuff, so I can’t rely on him," she said. "I can't close the business and wait until Rubashkin brings it to me." Gottesman is looking for other meat providers now. Mordechai Yitzhaky, the owner of Kosher Mart in Rockville, Md., says his meat supply is down 80 percent. He hasn't seen a price hike yet, but expects one if production doesn't return to normal soon. Yitzhaky says he won't pass on the increase to his customers, however. "Kosher meat is already more expensive," he said. "We don't want people to stop keeping kosher." Albert Zadeh, the owner of Pico Glatt in Los Angeles, buys all his meat and poultry from Agriprocessors, which sells its products under labels that include Aaron's Best, Rubashkin's, Shor Habor, Iowa's Best Beef and Supreme Kosher. Zadeh has seen a sharp decline in supply. "If you order 10 boxes of beef shank, you only get four," he said. There's also less poultry, and it arrives more haphazardly. "They used to send chicken legs, cut up," Zadeh said. "Now they give you whole chickens, all sizes, whatever they have." His customers "understand the situation," he said, and are making due with less. Prices have risen "a few cents," but for now Zadeh is absorbing the difference and charging his customers the same. Dov Bauman, the owner of Glatt Mart in Brooklyn, says his fresh poultry supply from Agriprocessors is down and he also is getting whole chickens instead of ready-to-sell parts. "I don’t have the manpower to break it down," he said. Prices have risen from 3 percent to 15 percent, Bauman says, depending on the item. But like other kosher retailers, Bauman doesn’t blame it all on Agriprocessors. 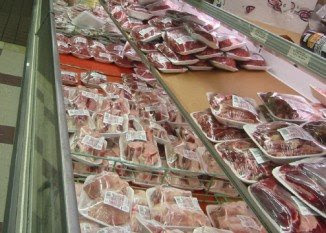 Fuel hikes, which increase shipping costs, are affecting meat prices as well, he says. And in a way, the tighter supply means more consumers are eager to stock up on kosher meat and poultry now in case the situation worsens. "I'm getting more business," Bauman said. Agriprocessors has taken several steps to boost its image and reassure customers, starting with the removal of the manager of the Postville plant, Sholom Rubashkin, the son of the company's owner and founder. The company also issued a statement June 5 announcing that it had retained Jim Martin, a former U.S. Attorney for the Eastern District of Missouri, to serve as its outside corporate compliance officer. Martin will begin his efforts immediately. Martin was quoted as saying that the company would be able to meet the needs of consumers. Marketing consultant Menachem Lubinsky, who represents Agriprocessors, acknowledges the "shortages in many markets," particularly outside New York. "Last week there was enough inventory," he said, "but it became depleted and people are buying more than usual." Prices have risen "sporadically," he reports. And other kosher suppliers, like Empire Kosher, have stepped up production in a bid to fill the supply gap. Part of the problem, Lubinsky says, is that Agriprocessors dominates the market, supplying 60 percent of the country’s kosher meat and 40 percent of its chicken. Any slowdown in its production affects the entire system, "and this comes at a time when demand for kosher meat is up." Meanwhile, more than 1,000 kosher consumers, including several leading rabbis, have signed a petition that calls upon Agriprocessors to treat its workers fairly and abide by all laws pertaining to workers rights and safety. The petition, which is being circulated by Uri L’Tzedek, an Orthodox social justice group in New York, also asks the company to create a transparent monitoring system open to third-party inspection, “so consumers can have faith that the meat is coming to them in an ethical manner,” said Ari Hart, a rabbinical student at Yeshivat Chovevei Torah and one of the four founders of Uri L’Tzedek. The petition states that if these conditions are not met by June 15, its signers will no longer patronize the company. Hart says the petition is not aimed at challenging the kosher system or hurting a particular supplier. "We have no interest in hurting the Rubashkin company or in promoting any other company," Hart said. "We are simply consumers of this meat, and our interest is in having an available supply of kosher meat we are comfortable purchasing."